Almost every expat I meet on the Bocas del Toro archipelago of northern Panama didn’t plan to live here in advance. Rather, the serenity of the place seized them and lingered. There’s Kelly, a healing practitioner who came on vacation and stayed, and is now practicing yoga with small groups around the islands. There’s Steve, the Flying Pirates ATV operator who lost his leg in a BASE jumping accident and lives in Bocas Town so he can avoid the temptation of tall buildings. Tamara, a stunning Swiss surfer, came to, well, surf, then fell in love with an American nonprofit worker and now works at 15-acre private estate Sweet Bocas (weekly buyouts only, from $80,500 per week, sweetbocaspanama.com). 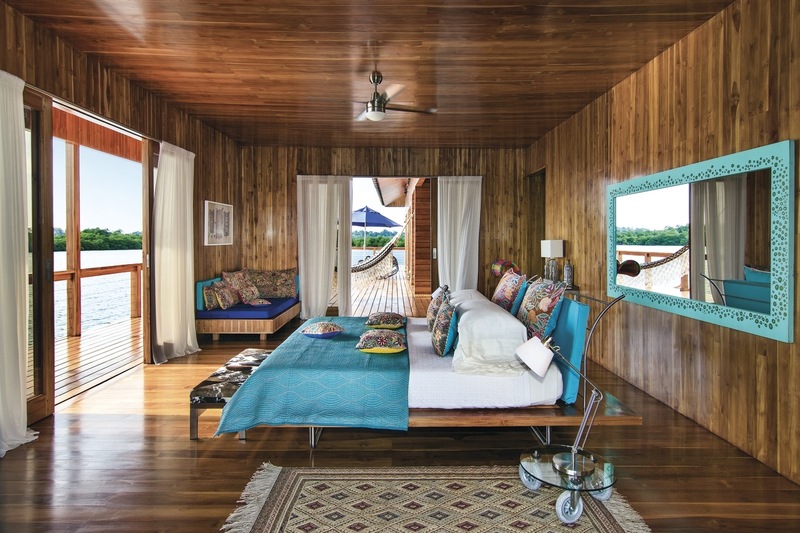 And there’s the owner of that estate, Annick Belanger, who visited this preternaturally quiet place, dreamed of a 20,000-square-foot overwater teak villa and built it. 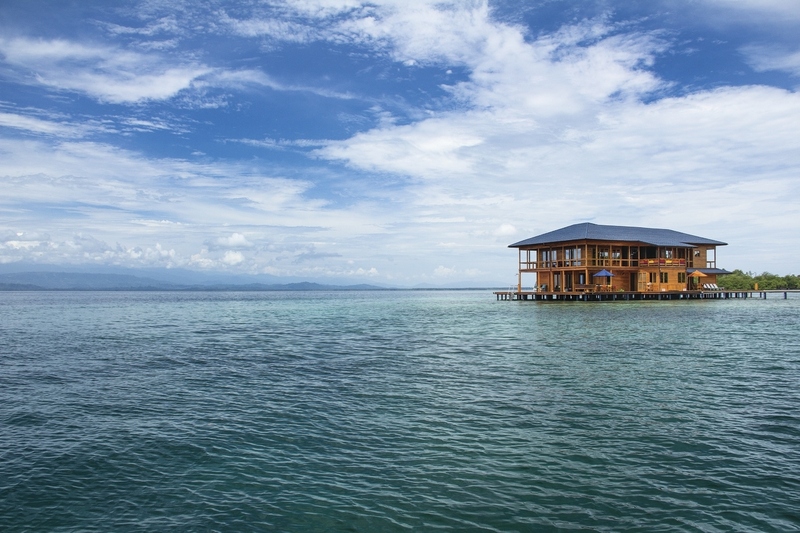 What Sweet Bocas offers is the ultimate private escape hatch from reality, in a place that is, by virtue of its own isolation even from mainland Panama, an escape. After reaching Panama City, we drive to Marcos A. Gelabert International Airport, on the site of the former Albrook Air Force Station, for an hourlong flight to Isla Colón, followed by a ride on Sweet Bocas’ private 30-foot yacht. (Those flying private to Isla Colón may skip a step.) I’m struck by the very stillness of the air as we arrive. There are nine main islands in Bocas del Toro, much of that area protected as lush national parkland and nature preserve, and 52 cays and thousands of tiny islets—and all lie south of the Caribbean’s hurricane belt. Locals rely on water taxis or their own boats for transportation to the store or out to dinner, so the feeling that you’ve arrived at the land that time forgot holds true around the province. 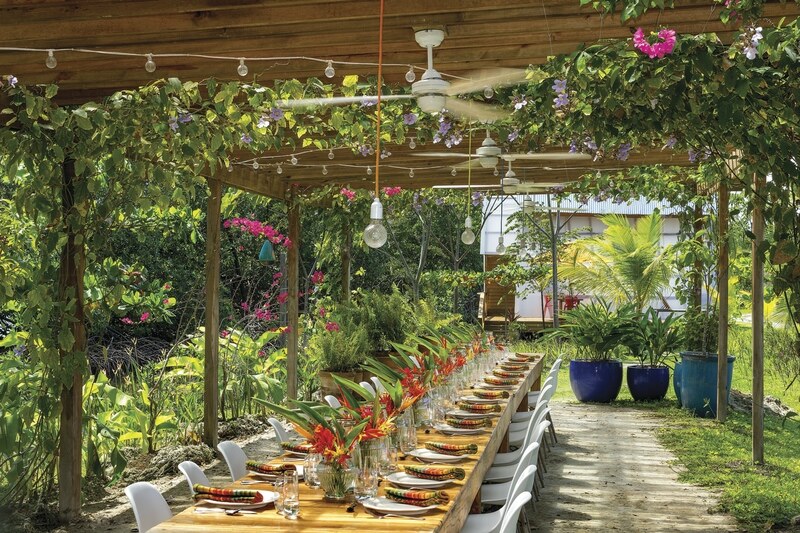 Our first glimpse of Sweet Bocas is of the villa itself—its canopies like multicolored sails flying on open waters. The property is built on a promontory that holds a freshwater lake, a gym and an infinity pool, tennis courts, and additional accommodations—none visible from the water. A long dock connects the villa to land, and from its broad surrounding decks, you can jump right into the warm ocean. Belanger operates the seven-bedroom villa much as if you were visiting the fully staffed private estate of a close friend. The rooms are free of televisions (though equipped with speedy Wi-Fi and Bang & Olufsen sound systems), and furnished with large, gracious beds that look out to endless seas. All the decor within has been carefully collected over a lifetime—from colorful Senegalese dining chairs woven from fishing nets to cushions made in the Peruvian Andes. Each evening, the dining experience is different. Think candlelight drinks on a motorized pontoon that cruises slowly around the lake, a long table set under a picturesque garden pergola and a cushioned Moroccan-inflected open-air villa. Everything from meals to canoeing, kayaking, paddleboarding, surfing, beach picnics, cooking classes and use of the yacht is included. A new collaboration with world champion surfer Terry Simms gives aspiring surfers a leg up, and Belanger’s team can arrange anything from on-site spa treatments to horseback riding. 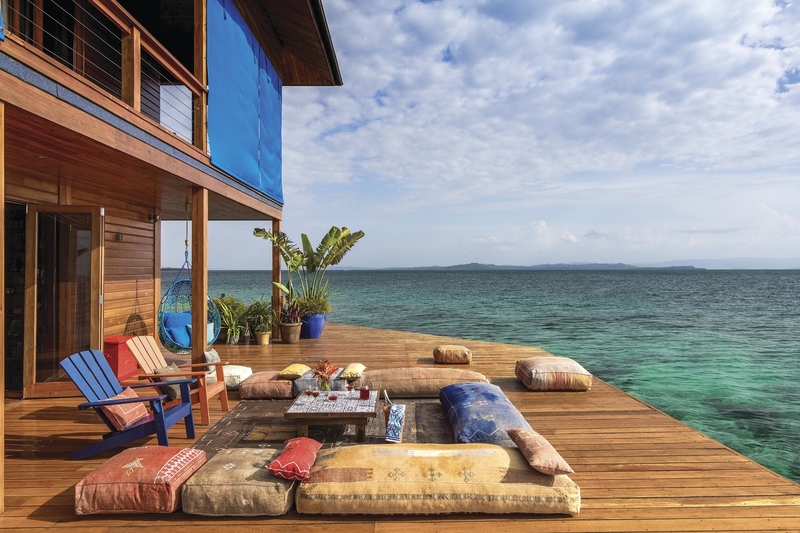 The overwater deck at Sweet Bocas can be transformed into a Moroccan-style lunch or dinner. The effect is effortless glamour, which makes sense when I learn Belanger, a former Montreal restaurateur, also helped plan the 2005 wedding of her friend, now Canadian Prime Minister Justin Trudeau. “There’s never going to be a word about anyone who visits us,” Belanger says when I press her to name some high-profile visitors. In fact, staff members sign nondisclosure agreements and even airport staff keep guest arrivals quiet. Belanger has orchestrated the entire property around a sophisticated permaculture practice that also sustains gardens, a greenhouse and a fruit forest, and supplies Ecuadorian chef Wilmo Ordoñez, who arrived having worked in the famed Gustu in Bolivia and Panama’s Maito. It’s what he does with this bounty that is spectacular. Each meal is a multicourse spectacle of beautifully composed dishes dictated by the day’s catch and harvest: a simple Ecuadorean ceviche studded with roasted chickpeas; dramatic octopus tentacle with potato mousse and tamarind barbecue sauce; risotto studded with chunks of lobster; a whimsically postmodern lemon meringue tart. The outdoor dining pergola adjacent to the freshwater lake features an outdoor kitchen so guests can dine on fresh multicourse meals prepared only steps away. Those who visit exclusively to play miss a vital part of Sweet Bocas’ existence here, which is to provide an immersive travel experience that will help the indigenous communities of Bocas del Toro. “Whereas many indigenous tribes around the world have been mistreated and completely forgotten, we hope to be able to make a little bit of a difference in as many lives as we can,” Belanger says. To that end, Sweet Bocas employs indigenous people throughout the resort, and its Dreamcatcher Foundation works with organizations like Give and Surf (giveandsurf.‌org), which builds and maintains schools in the community. On one morning, we join volunteers from Give and Surf to pick up preschoolers by boat from their scattered family docks and transport them to school. In effect, Sweet Bocas is an idyllic model for luxurious sustainability and community engagement—catering to luxury travelers while making them care. And, as I imagine happens more frequently than not, I have a fleeting thought during a morning yoga session: What if I simply decided not to return home? I wouldn’t be the first.